RARE AND COLLECTIBLE Vintage Belt Buckle. " 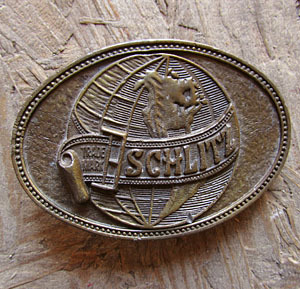 Trademark, SCHLITZ" is written on a big Belt that is Wrapped around a grid-lined globe. Very Cool! Lighter Brassy Finish. We have Four Buckles in the Style, some of them are a little darker. Condition: Very Good, Slight spots of Patina, may need a little rub down. Also has a few small dings. Sitll an amazing vintage belt buckle.